A few weeks ago, I picked up some fabric samples from a local furniture store. The store had advertised on Facebook that they were giving away the fabric sample books because the company discontinued those fabrics. Once I picked them up, I was trying to figure out what I'd do with them. Well, I came up with one project. I decided to used the fabric on a wreath. My idea was the create a wreath with a white picket fence, grass, trees, a dog, a birdhouse, clouds/sky, and flowers. I used the fabric to create rosettes to form the trees, the sky, and the flowers in the "grass" (I used floral moss for the grass). I hot glued the moss onto the straw wreath. I was going to affix these wooden clouds to the wreath, but I decided to use them as the backing for the tree tops. I created rosettes to create the green tree tops. I had two different kinds of fabrics. These were the textured shades of green. These are the faux silks in green. I made three burgundy rosettes for flowers. This is a tree. I painted the birdhouse red, white, and blue. I used both faux silks and textured fabrics in different shades of blue to create the sky. My daughter loves bumblebees, so I had to add one to the wreath. I wrote Welcome on the chalkboard and glued on the birds in the nest. This is one of my favorite wreaths, and my mother says it's a spring wreath, but I consider it my everyday wreath for when it's not a holiday season. 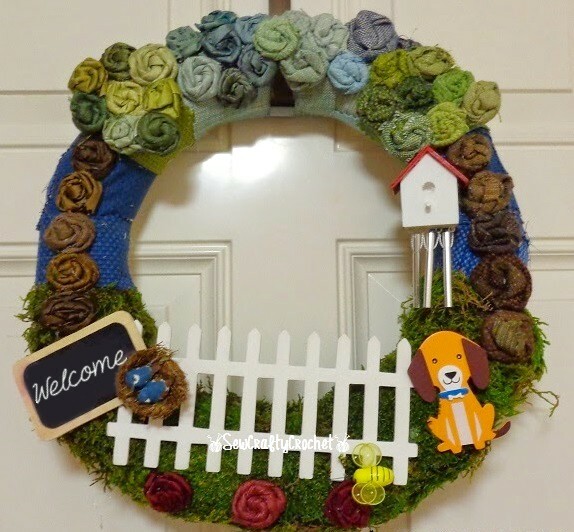 For me, this wreath with its white picket fence represents the American Dream to own a home with a white picket fence (and a loyal dog). Thanks so much!! It was such a fun wreath to make! Monroe this is absolutely adorable. And you created this from scraps. Talk about great imagination!! Thanks Mary! It's on of my favorite creations.